A few days ago, I had the idea that I wanted to brew a classic Hefeweizen. In my few years of homebrewing, I had actualy only ever done a “proper” Hefeweizen once, and it was the “Almtaler Hefeweisse” kit from Hopfen&Malz. I wasn’t overly impressed by the specific beer, it seemed a bit too watery for my taste. But then, that may have been purely because it was my third beer that I ever brewed. After that, I brewed two more Hefeweizen, but both with a twist, i.e. a heavy late aroma hopping, followed by some dry-hopping with Nelson Sauvin. That beer was a success, but it’s definitely not your classic Hefeweizen. A Bavarian Hefeweizen has some specific properties: it’s brewed from a mix of barley malt and wheat malt, with the wheat being at least 50% of the grist. Some commercial examples even contain as much as 70% wheat malt. The beer is cloudy, both from proteins from the wheat malt and yeast in suspension, and while pale, it’s usually a tad darker than your German pale lager, sometimes even going towards a reddish hue. Hop bitterness is very low, with no hop aroma. Alcohol-wise, the typical commercial examples usually have 4.8 to 5.5% ABV. The yeast strains used for that style are top-fermenting. Historically, Hefeweizen did not conform to the Bavarian Purity Law (Reinheitsgebot) because it contains wheat malt, while the Reinheitsgebot only allows barley malt. Special permits were instead issued to those who held the privilege to brew with wheat. Because I wanted to brew a Hefeweizen on a rather short notice, I went to Bierlieb and got some ingredients. Their choice in ingredients is alright but not great, but definitely enough for quite a few German beer styles, your odd IPA or Belgian-style beer. Unfortunately, they only offer dry yeasts, so I had to get WB-06. Now, the thing is that I’ve heard quite a few bad things about WB-06, namely that it’s a rather bland yeast that produces only tiny amounts of the typical phenolic and ester notes of a proper Hefeweizen. My previous experience with dry yeasts in general and specifically Fermentis dry yeast has been rather good so far (S-04 is my standard for most British styles, US-05 is the Chico strain and so probably the standard for almost everyone’s American styles, and Saflager W-34/70 and S-23 have worked for me in the past, too), so I wanted to give them a try nevertheless. Just to be sure that I would definitely get enough phenolic (clove) and ester (banana) notes in my Hefeweizen, I was looking for a way to optimize my wort production to provide the yeast with as much of the precursors as possible. For the clove notes, that’s relatively easy. The phenolic clove notes in Hefeweizen come from the specific yeast strains metabolizing free ferulic acid to 4-vinyl guaiacol. Ferulic acid is in the malt itself, but it needs to be freed and available in the wort. That is usually done through a ferulic acid rest, at about 45 °C. The banana notes on the other hand are esters, iso-amyl acetate and ethyl acetate, and their production by the yeast directly correlates to the amount of glucose in the wort. So obviously, I’d need to do a mash in a way to increase the amount of glucose. Fortunately, there is a pretty cool method for that, the Herrmann method, or Herrmann-Verfahren in German. It is named after Markus Herrmann who wrote his doctoral thesis at Weihenstephan about the formation and influence of flavouring substances in wheat beer about a decade ago (sorry, German only!). The principle behind the Herrmann-Verfahren is relatively easy: malt contains a number of enzymes which manipulate starches and complex sugars at specific temperatures. The most important ones are alpha- and beta-amylase that do most of the work. But there is another enzyme, maltase, which can break down maltose into glucose. Unfortunately, maltase works at about 45 °C, and is quickly denatured at higher temperatures. 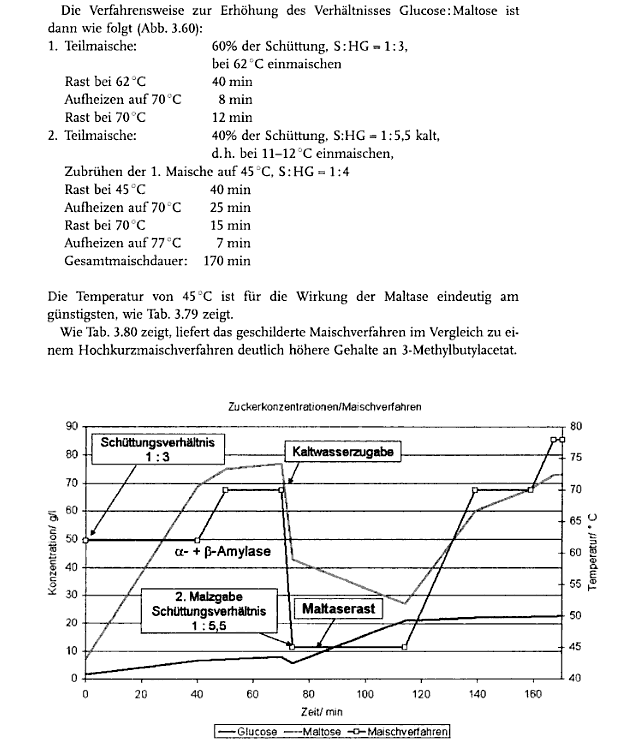 So Herrmann designed a mash schedule that first produces a good amount of maltose through a straightforward Hochkurz infusion mash, with 60% of the grist. Then, a second mash with the remaining 40% of the grist and cold water is done, which is then added to the first mash, bringing it down to 45 °C. That way, the maltase enzymes from the second mash can munch on the maltose produced by the first mash and create more glucose. After that mash, a second dextrinization rest is conducted, followed by mash-out. That way, you end up with a wort with a lot higher amount of glucose, eventually leading to more esters after fermentation with the right yeast strain. Coincidentally, the 45 °C of the maltase rest is the same temperature that is also necessary for the ferulic acid rest. 60 minute boil. 10 IBU. Mash as described above. WB-06 yeast. OG 13.25 °P. For carbonation, I’m using about 7.5% of the wort as Speise. For fermentation itself, I’m chilling the wort down to about 17 °C, then I’ll pitch the yeast, and will let the temperature freely rise to ambient temperature (about 23 °C in my flat at the moment). Fermentis recommends for the WB-06 yeast to keep a temperature below 22 °C for clove flavors and above 23 °C for banana flavors. Given that my wort provides the yeast with enough glucose and ferulic acid to actually produce either flavors above the perception threshold, I should be fine with that fermentation schedule to achieve a hopefully balanced Hefeweizen with all the right aromas and flavors and none of the wrong ones. As soon as the beer is finished, I’ll report back about the results.